Some of our specials are featured below but it is best to call us to find out what is available right now. When homeowners think about possible hazards garage doors don’t generally come to mind. However when garage doors that are improperly installed they can be dangerous in several regards. Firstly they can be hazardous to install. Secondly they can provide one of the easiest ways for intruders to break into a home. Thirdly they can cause injuries to children. Installing doors can be dangerous. Falling off ladders in one danger among many. Always use a reputable installer who is fully insured, well trained and complies with WSIB practices. Installers who operate out of the back of their truck often save money by cutting corners on safety and the homeowner can be liable if they have an accident. The torsion spring that assists the door when opening stores a lot of energy. Never try and adjust it unless you know what you are doing. If it releases unexpectedly it can easily break a wrist or cause other injuries. Make sure the light sensors on your garage door are working properly. Test them by rolling a ball under the closing door. Does it reverse instantly? Also garage door openers are designed to reverse direction when meeting an obstruction. If your door does not reverse readily after contacting an obstruction, call us. Irrespective of the technology, particularly if you have young children or pets you should always watch the door until it closes completely to make sure nothing gets caught under it. Your door should be easy to open and close when disengaged from the door opener. If it is not the tension spring or rollers need attention. Doing this can be dangerous. 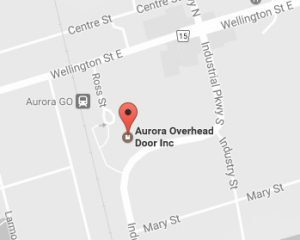 When repairing please be careful or call Aurora Overhead Door. The wall push button for your garage door opener should be mounted at least five feet above the floor, out of the reach of children. Running under a closing door can be deadly. Make sure children never play with opening and closing the door. If you park a car outside your garage, be sure to lock your car so that potential burglars cannot access your remote control and gain easy access to your garage. On early models of garage door opener remotes thieves are able to record the transmitter’s signal enabling them to open the door when no one is home. Make sure your remote control has rolling code technology. Call us if you need this checked.